HOW IMPORTANT IS CHEST BODY ARMOR? 500CC Grand Prix Star CARLOS CHECA almost lost his life in 1998 due to a chest injury. 1996 World Superbike Champion TROY CORSER lost his bid for a second world title in 1998 due to a chest injury. And, Year 2000 500cc Grand Prix World Champion ALEX CRIVILLE almost missed the last race of 1999 (and possibly much, much more) due to a chest injury. 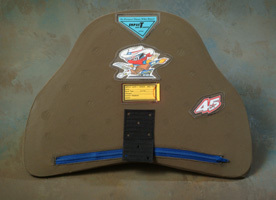 Wearing our Impact CHEST protector can reduce or eliminate the risk & severity of such injuries! Developed during the heat of competition......Worn to victory in the United States, Europe, Africa, Asia & Australia. The C-008 Chest Protector represents the most advanced technology available today! PATENTED PROTECTION TECHNOLOGY THAT WORKS! "PATENTED"EXPANDING POUCH TECHNOLOGY; delivers superior impact dissipating performance,adjustable ergonomics and performance upgrades capabilities! 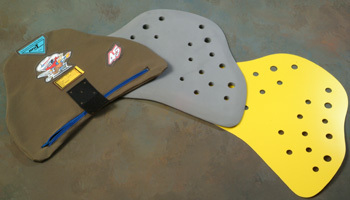 ANATOMICAL HAND SCULPTED nitrile foam impact core with ADVANCED STERNUM and RIB PROFILE; provides greater frontal and side impact protection along with a custom fit. ONE PIECE POLYCARBONATE IMPACT DIFFUSER; Increases the impact deceleration control surface area of sternum and ribs to 100%....while improving comfort and airflow. Expanding Pouch EASY OPENING ZIPPER; The C-008's easy access zipper replaces the previous hook & loop closure system. Internal protection components can now be inspected or replaced IN NO TIME!! **Comes with free flow mesh expanding pouch.